This 26.25" diameter oversized gallery wall clock features an antique dial within a wrought iron frame with an oil rubbed bronze finish. The aged parchment background includes names of well-known French cities faded in the background. 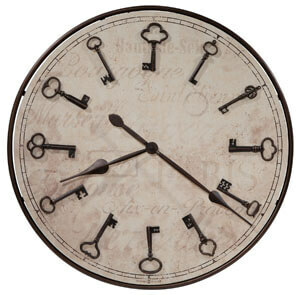 Applied vintage skeleton key hour markers and spade hands finished in oil rubbed bronze complement the frame. You will save $74.70 (30 %) on this Howard Miller Cle Du Ville 625-579.